The commercial tree plantation located in the Kiboga District, the ‘cattle corridor’ of mid-western Uganda, under the name of “Kikonda Forest Reserve”, covers 12,182 hectares of land owned by Uganda’s National Forestry Authority (NFA). 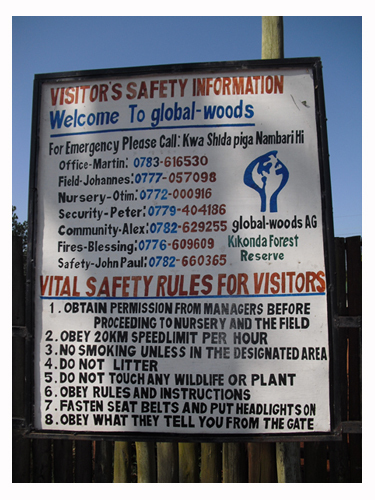 The land is managed, however, by the German private shareholding company Global-Woods AG. The plantation project started in 2002 with a 49-year ‘tree-farming’ lease agreement granted by the NFA. Each year, around one million trees are planted over an area of 1,000 hectares, with the goal of capturing carbon dioxide from the atmosphere and ‘storing’ it as well as of producing saw logs and fuel wood (1). Since Global-Woods started the project, there have been continuous conflicts with local communities since they are forbidden to cut trees, practice agriculture or graze animals in the area of the project. Collecting charcoal and grazing cattle in a ‘reserve’ are illegal under Ugandan law, but this was not being enforced prior to the project. The restriction of agricultural and grazing access also caused so-called contradictions in management; whereby at times grazing was allowed for a fee, whilst at others times fines of around US$400 were levied. Cattle keepers lost access to the ‘valley dams’ that were specially constructed for cattle keepers in conjunction with Irish Aid in the reserve in 1992. After 2009 an internal review indicated the need to change strategy, and the company built two dams outside the reserve for cattle access (3). The tree plantation project is certified by the CarbonFix methodology, a certification for carbon offset projects. CarbonFix was recently acquired by the company Gold Standard, which also provides certification for projects to sell carbon credits (4). The certifiers confirmed in their certification report that the project is expected to store 888,033 tones of CO2e over the 50 years the carbon calculations are made (even though the lease Global-Woods holds is only for 49 years, and planting did not start immediately after the lease was acquired) – the ‘sequestered’ amount translates into carbon credits that the project owner can sell on the carbon market. The project has also been certified under the Climate, Community and Biodiversity (CCB) Standard, another scheme that developed guidelines against which projects selling carbon offsets are assessed, in particular in relation to social and environmental impacts. A third set of consultants has certified the management of the tree plantations according to the standard of the Forest Stewardship Council (FSC). The question that arises, then is – how can so many standards ‘back’ a project characterized by conflicts and contradictions? The CCB standard requires that the certified project must deliver net benefits to communities, and the Project Design Document (PDD) must present “a credible estimate” of the net benefit of changes in community wellbeing as a result of project activities. The PDD for Kikonda argues that communities surrounding the plantation will benefit from employment opportunities on the plantation, and from support for planting trees on private land through an organisation that has been formed around the project. However, only private landowners can benefit from the tree planting activities, and a Global-Woods report reveals that only four per cent of the households in the area around the project have titles to the land that they cultivate. It was also expected that community members could benefit directly from forest carbon payments for trees planted in a buffer zone around the project, but this initiative has already failed. It has been discontinued. Communities around the project area complain about a high level of conflict with the project: fines, arbitrary arrests of people and impoundments of cattle entering the reserve, denied access to water tanks that were constructed for use by the communities, widespread corruption among forest rangers, etc. Only in 2011 – 9 years after the start of the project – did Global-Woods carried out what they call a “socio-economic baseline survey”. The report confirms many of the problems that the communities had been complaining about, and also reveals some very significant gaps in the project proponents’ knowledge about the communities in the project area. The most recent survey report states: “Originally, it was assumed that there were 20 communities and the aim was to include all of these. During the survey, we became aware of more communities within the area and in total 44 communities were recorded.” This means that Global-Woods did not have even the most basic understanding of the surrounding areas – and that auditors from several certification schemes certified the project despite such fundamental errors in project documentation. It is clear from the CCB project validation report that the auditors have observed many of the shortcomings of the project with regard to negative impacts on communities, baselines and monitoring. However, rather than requiring these problems to be addressed, “Forward Action Requests” were issued for the project to address – at a later stage. The auditors even issued a ‘Silver level’ certificate, in part based on the assessment that the project met the criteria for “Best Practice in Community Involvement”. Likewise, CCB certified projects must generate “net positive impacts on biodiversity within the project boundaries and within the project lifetime”, measured against the baseline conditions. Projects should also have no negative effects on species included in the IUCN Red List of threatened species or species on a nationally recognized list. Kikonda involves large-scale monoculture tree plantations replacing existing degraded forest, shrub and grasslands. This undoubtedly has many serious environmental impacts and will cause a direct loss of biodiversity in the area. The project proposes to balance the negative impact by conserving and enhancing biodiversity on a smaller ‘conservation area’ within the project boundaries. The carbon offset project thus claims to also be a ‘biodiversity offset’ project within the project. However, a look at the map reveals that the ‘conservation area’ has not primarily been defined on the basis of biodiversity considerations. The area is a gully with a watercourse and wetlands. The set-aside area is thus primarily made up of land that is not suitable for being converted to pine plantations. Furthermore, planting in at least parts of these areas is also restricted due to NFA rules. As a result, community members see their livelihoods destroyed for vague promises of (poorly paid) employment on plantations that are set up on land they have used under customary law. While local populations are criminalized or chased away altogether, foreign companies, certifiers and investors, who take advantage of leases and legislation favouring private capital, are able to sell timber and carbon credits for their own gain.